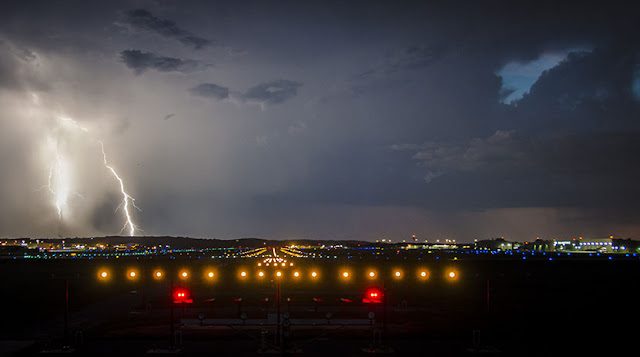 While taking night pictures at Bill and Hillary Clinton National Airport, Brent Murray captured a lightning strike over Little Rock, Arkansas. Just before sunset, Brent was taking pictures of the Runway 22R lighting system. A storm began rolling through in the distance, and Brent snapped this photograph just as a lightning bolt touched down. Before the photo shoot, Brent and his team coordinated with air traffic control and airport operations and then took pictures of the runway lights, which provide lead-in guidance for pilots in low-visibility conditions. For nearly 60 years, Garver has provided Clinton National Airport with engineering and construction-phase services. Garver's recent services include multiple runway extensions , taxiway centerline lighting for an updated SMGCS (surface movement guidance and control system), and electrical support services for runway lighting and signage improvements.